I ran across these notes I made from my own reading of “Hot, Flat, and Crowded” last fall. Two stories illustrate Friedman’s point about the importance of incentives and also of standards and regulation. We usually hear the side of the equation that regulations are going to cost the consumer more. This is not necessarily true, because when you are innovating, you can often design something to be manufactured more cheaply. One example is from when the EPA issued the Tier 2 emission standards for locomotive engines in the early 2000s. It was a standard for NOx, not CO2. It had to do with air quality; carbon was not on the radar back then, although it should have been. G.E. is the world’s largest maker of locomotives, and they do it in Erie PA. They could have just tweaked their engine design. Instead they looked at it as a clean slate. They went to the drawing board and designed an engine that met those emission standards, was much more fuel efficient, and much more reliable in terms of maintenance. The CEO of the locomotive division openly admits that it was that EPA regulation that caused them to innovate. By having the standard, your competitor also has to meet the standard. There’s no more guesswork if you put all this time into R & D whether there is going to be a market for your innovation. It turned out that, because the G.E. locomotive was more fuel efficient, it also had much less CO2 emissions. G.E. sells all over the world – to China, India, Europe. Those countries were already starting to put carbon regulations into place. G.E. was ahead of the curve in curbing CO2. Their engine is still one of the only ones that meet the new regulations being passed around the world, including in China. The point is not this, but that it spurred innovation. The catalytic converter is an “end-of-pipe” solution, just like smokestack scrubbers. A little car company called Honda went back to the drawing board and created a thing called the CVCC engine (Compound Vortex Controlled Combustion). The team of engineers met and resolved to look at the engine and design it to burn the fuel more cleanly. 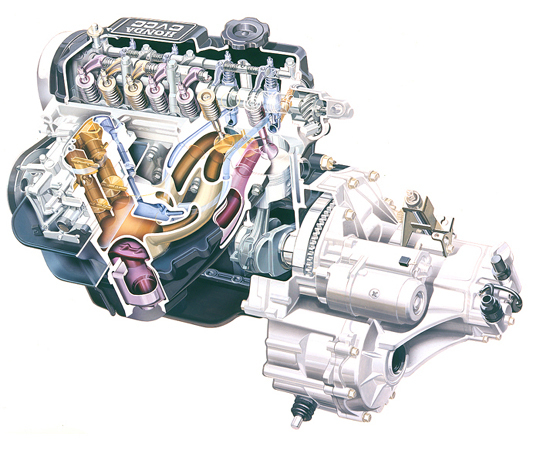 They redesigned how the combustion engine burns fuel, and at that time were able to meet the standard without a catalytic converter. Yes, incentive programs are a great way to get us to convince business and industry to adopt green practices. And, regulations will help level the playing field, bring everyone up to a standard, and spur innovation.